SEOUL, April 15 (Yonhap) — North Korean leader Kim Jong-un vowed Sunday to bolster his country’s military as world powers discuss ways to punish the communist country for carrying out a banned rocket launch. Kim said the superiority of military technology is no longer a monopoly of imperialists and the North is not threatened by its enemies’ atomic blackmail any more, in an apparent reference to the United States. “We should strengthen the People’s Army in every way as we can,” Kim said in Kim Il-sung Square in Pyongyang, according to a text of his speech provided by South Korea’s Unification Ministry. The ministry, which handles inter-Korean affairs, monitors North Korea’s state media. 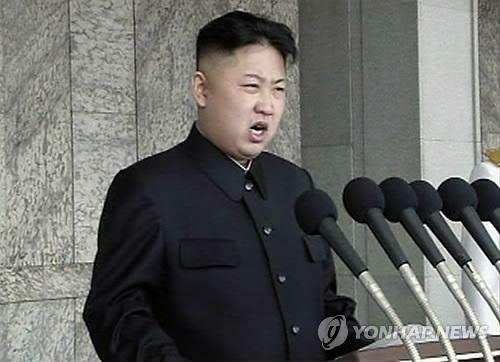 It was the first public speech by the young leader since he took over the country following the December death of his father, long-time leader Kim Jong-il. The young Kim also said peace is valuable to the North as it seeks to build a powerful country and improve its people’s living standards. “However, dignity of the nation and sovereignty of the country is more valuable for us,” he said. Kim’s speech was followed by a massive military parade in the square to celebrate the centenary anniversary of the birth of his grandfather, the country’s late founder Kim Il-sung. The show of force came just two days after Kim suffered international humiliation over a failed rocket launch. The North apparently planned to use the launch as an official illustration of its status as a prosperous and powerful nation, but the rocket exploded soon after lift-off and crashed into the sea off South Korea’s west coast. The failure seems to have dealt an embarrassing blow to the young leader who has been seeking to establish his credentials through the high-profile event in defiance of international warnings. Kim has assumed all key posts in a series of recent political events, completing a process to formally wrap up the power transfer. Kim said in his speech that he will uphold the instructions of his father who pursued nuclear and missile programs and a military-first policy, in the latest indication there will be no shift in the country’s policy. In December, the North said the world should not expect any change from it. Also Sunday, Kim visited the Kumsusan Palace of the Sun to pay tribute to his father and grandfather. The mausoleum in Pyongyang is considered a sacred place, as it is home to the embalmed bodies of both former leaders. In South Korea, some 40 North Korean defectors and activists launched balloons carrying about 200,000 leaflets into the North near the heavily fortified border to condemn the power succession and the rocket launch. The rocket launch failure was widely expected to overshadow the festive mood in Pyongyang, though some experts said it may not be the case in the communist country. “The launch was intended to coincide with these celebrations and its failure is therefore embarrassing. However, within North Korea itself the tightly orchestrated celebrations are unlikely to be diminished by the launch’s failure,” said Neil Ashdown, an Asia and Pacific analyst for IHS Global Insight, a consulting firm. In New York, the U.N. Security Council “deplored” Pyongyang’s rocket launch in a verbal statement Friday, prior to an expected release of a written response. Ambassador Susan Rice, the U.S. envoy to the U.N., said the council members agreed to continue discussions on an “appropriate response.” The U.S. holds the rotating chairmanship of the 15-member panel this month. The U.N. body is expected to issue a presidential statement as China and Russia, two veto-wielding powers of the council’s five permanent members, are against issuing a resolution. “The more important thing is what to contain in a bowl, although we prefer the stronger both in formality and content,” South Korean ambassador to the U.N. Kim Sook said Saturday, hinting Seoul will seek a less stringent council presidential statement rather than a resolution. Ashdown said any further international condemnation or U.N. resolutions could embolden sentiment within the North for a further nuclear test. “It is of sufficient concern that North Korea might relive its failed rocket launch in April 2009, when it compensated for the failure with a successful nuclear test within a month,” said Poornima Subramaniam, an Asia-Pacific armed forces analyst at IHS Jane’s. The Choson Sinbo, a pro-North Korean newspaper in Japan, recently reported that North Korea may carry out a nuclear test if the U.S. scraps its promised food aid in retaliation for Pyongyang’s rocket launch. North Korea and the U.S. reached an agreement on Feb. 29 that called for a moratorium on missile and nuclear tests by North Korea in exchange for 240,000 tons of food aid from the U.S.
On Friday, the U.S. announced that it would nullify the deal to provide food aid to the North. South Korea has estimated the rocket launch cost North Korea some US$850 million, the equivalent of feeding 19 million people for one year in a country of 24 million people. This entry was posted in In the News and tagged china, Japan, kim il sung, Kim Jong Il, Kim Jong Un, launch, lee myung bak, ministry of unification, missile, MOU, north korea, nuclear, obama, pyongyang, rocket, Russia, satellite, south korea, speech, un, United Nations, united states, uranium by MOUonekorea. Bookmark the permalink.